Our urban landscape bears little resemblance to pre-development conditions. Consequently, formally local natives may be unable to succeed in these altered environments. What plants are then most appropriate? Rather than looking to a past that is no more, it may be best to use our understanding of the ecological services plants provide. A review of research by Linda Chalker-Scott (2015, Arboriculture & Urban Forestry, 41.4, 173-186) suggests that both native and non-native woody species can enhance biodiversity of urban landscapes by providing these essential services. At this risk of wonkiness, do we have a Hegelian plant dialectic here, perhaps? Are we on the cusp of a synthesis in the native/non-native plant debate? This is a complicated question, but I think that Eisenstein makes some good points in this provocative interview. Props to David Newsom at the Wild Yards Project to allowing this conversation go where it went. Eisenstein goes on to talk about what she considers most important for attracting birds and insects to our gardens. Spoiler: it’s more about the leaf litter than the plant selection. Make sure to read the rest of interview on the Wild Yards Project website. 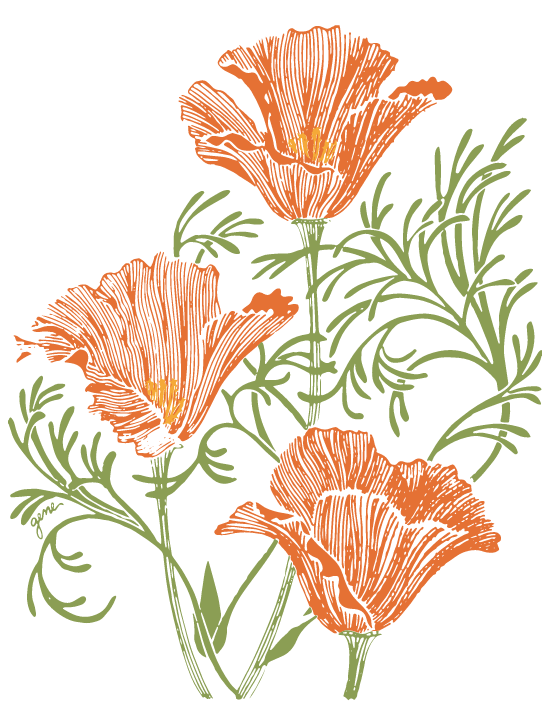 And consider signing up for the newsletter and adding to the Wild Yards tip jar. The gardening equivalent of Beyoncé’s triumphant 2018 Coachella performance took place on the very same weekend. Theodore Payne’s annual garden tour reunited pollinator friendly plantings, low water use and great design in a sort of horticultural equivalent of the return of Destiny’s Child. 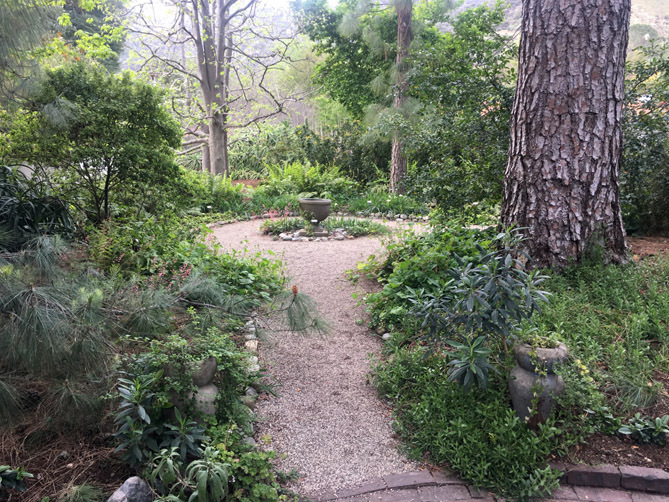 Lush and traditional garden design even made a Jay-Z like cameo appearance at the stunning stunning Wilson/Leach garden in Altadena (seen above). 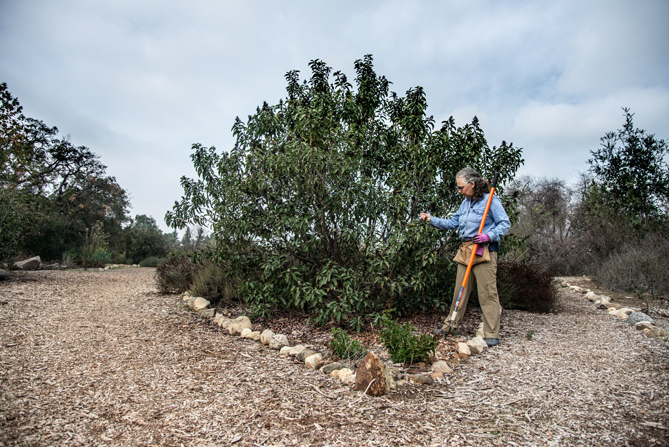 Native plants gardens in Southern California don’t have to look like a desert! The big takeaway for me from the garden tour this year was that sometimes you’ve got to call in a garden design professional unless you have a knack for design (and I don’t). Our ticket contest winner (who gave us the most beautiful basket of home grown fruits and preserves ever–thank you Donna!) came to the same conclusion. 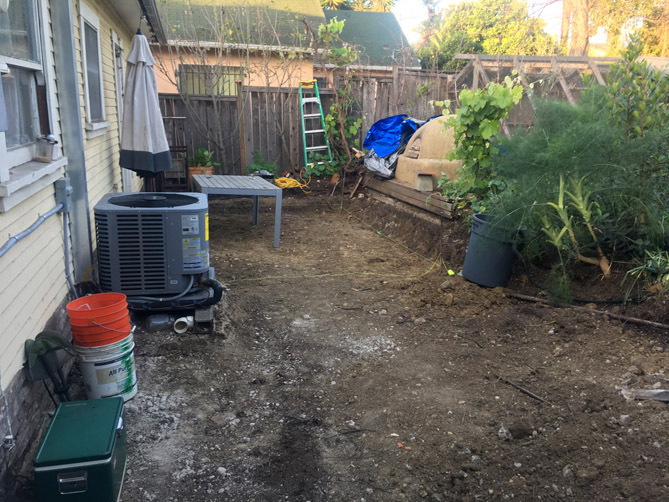 A crew took out an ugly concrete patio last week and has been digging down to lower the level of the new patio they will install. The old patio was above the level of the sill plate and was causing the back part of the house to rot. I’ll post more in-progress photos over the next few months. We’re also working on the inside of the house. When all is done we hope to have some events here and open up the house for idling and entertaining. If you can’t afford a crew to do the work you can, at the very least, hire a designer to do a consultation and offer some suggestions. I really wish we had done this 20 years ago when we bought this place! A reminder that you have until 5pm today to enter our Theodore Payne Native Plant Garden Tour ticket giveaway. We have slowly introduced more and more native plants into our garden for a few reasons: to reduce water use, to sustain wildlife and to reduce maintenance. On that last point I’ll note that there is no such thing as a zero maintenance garden, but I will say that California natives are, generally, a lot less fussy than annuals. This year we’ve also decided to hire a professional to come up with a design for our troublesome backyard. The first order of business is to jackhammer out an ugly concrete patio and deal with some possible foundation issues. I’m hoping, with our designer’s permission, to share the work in progress. I’ll just say at this point that it’s really helpful to have an outside set of eyes especially if you’ve been living with a space for so many years that you’ve lost perspective and openness to new ideas. Lastly, I must toot my digital horn and note the excellent timing of my February 28th anti-Facebook rant. It’s time to #DeleteFacebook and #StartGardening with #NativePlants.